Roasted rhubarb with ginger white chocolate crunch ice cream | dash.drizzle.dollop.devour. Rhubarb and ginger – a food pairing made in heaven. My idea of heaven anyway! I get totally overexcited when my favourite foods are in season and rhubarb is no exception. Whilst you can get rhubarb pretty much all year round, forced English rhubarb is only around for a couple of months, so I like to cram in as many rhubarb puddings as possible with this extra special bright pink bundle of joy. Since I discovered no-churn ice cream recipes I’ve never looked back, to the point where I very rarely bother making a traditional custard based ice cream at all. Despite the lackadaisical approach, the results are great and a relief from the tyranny of hourly stirring or filling my freezer with another seldom used piece of gadgetry. This recipe produces a creamy, smooth ice cream which you can pretty much spoon straight from the freezer. A little note on the crunchy bits before you start. When I was initially dreaming up this ice cream, I envisaged a smooth gingery ice cream punctuated by little crunchy biscuity nuggets. Yet when I came to eat my creation, I decided I’d probably have preferred the biscuit bits just crumbled over the top. Up to you. The first step is to make the ginger crunch. Melt 200g white chocolate either in the microwave or in a bowl suspended over hot (not boiling) water. Do take care, white chocolate is more volatile than other chocolates. Put 175g ginger biscuits into a food bag and give them a bash with a rolling pin or other heavy implement. You want small chunks rather than the fine crumbs you might use for a cheesecake base. Bash away until you have the sort of size bits you might want to find in a scoop of ice cream. Tip these into the melted chocolate and stir thoroughly. There should be just enough chocolate to lightly coat them. At this point, I had a little taste of the mixture and decided that the white chocolate was making the overall result a little sweet. The idea behind the chocolate coating was to protect the biscuit from going soggy in the ice cream mixture, but, for me, it was detracting a little bit from the ginger flavour. So I fixed this by sprinkling over a good couple of teaspoons of ground ginger which rehabilitated it back to a suitable level of gingeriness. Spread the biscuit mixture out on a tray lined with a piece of greaseproof paper and put somewhere cool to set. Meanwhile, make the ice cream base. Empty a 397g tin of condensed milk into a bowl. Roughly chop 3 or 4 balls of stem ginger and stir into the condensed milk, along with 2 tbsp of syrup from the jar. Finely grate a 5cm chunk of peeled fresh root ginger into the mixture. It needs to be a really good sized piece. I decided to use root ginger to give the ice cream a fresh, lively, almost citrusy quality, to cut through the heavy sweetness of the condensed milk and the white chocolate. Have a taste and see if you want to add even more, aiming for a distinct ginger flavour, fresh and bright, but not too overpowering. In a separate bowl, gently whip 500ml of double cream, so that it is soft and just thickened, not at all stiff. It doesn’t take much effort to get double cream to this stage. Pour in the condensed milk mixture and fold together to combine, then pour into your freezer container. Your biscuit mixture should have set by now and will need breaking up a bit again. Swirl at least half of it through the ice cream mixture, if this is your chosen destiny for it, reserving the rest for crumbling on top. This probably needs a good 6 hours or so to freeze, preferably overnight. Rhubarb needs a slightly unnerving amount of sugar to cut through its sourness and bring out its fragrant, fruity flavour. 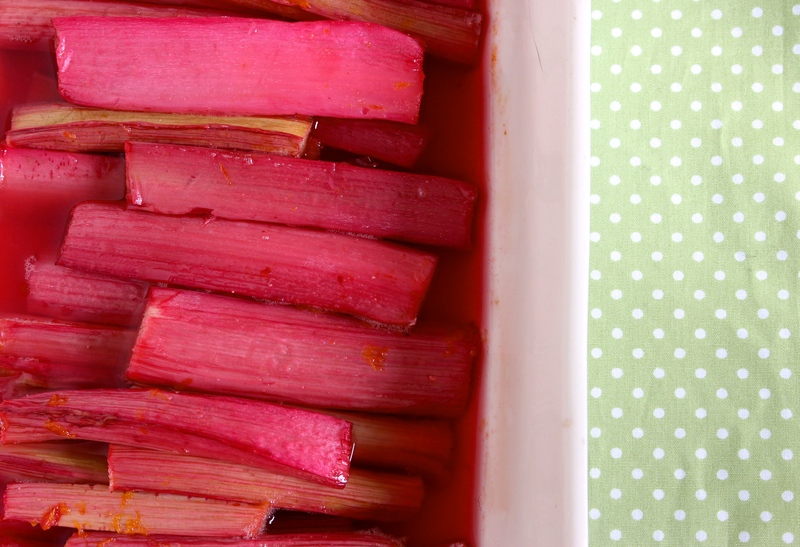 Slice about 800g rhubarb into approximately 10cm lengths and line up in an ovenproof dish. Squeeze over the juice of an orange (I used a blood orange, also in season and also exuding a fabulous pinkness) and sprinkle over about 6 tbsp caster sugar. Bake in a pre-heated oven, at about 160C, for 20 minutes or so, until tender. The great thing about roasting the rhubarb is that the stems retain their shape and colour, rather than descending into a pale pink mush, which generally happens if you stew them. 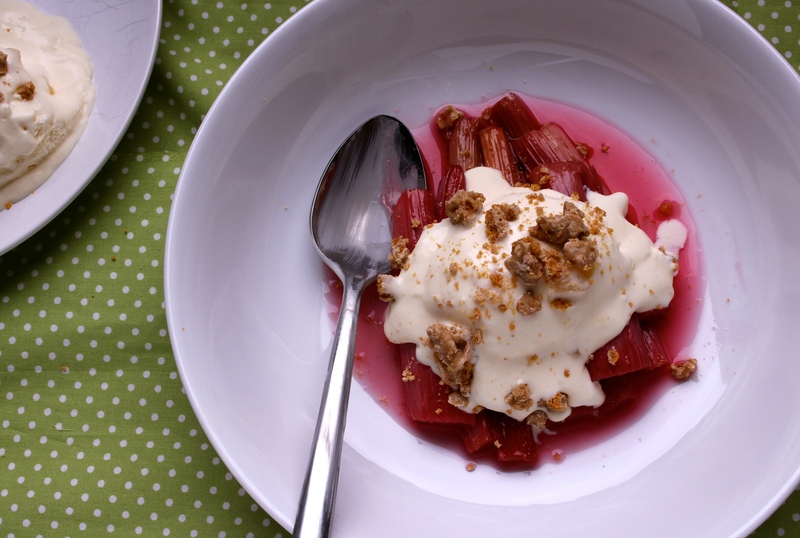 Serve the rhubarb warm, with the ice cream and an extra sprinkle of ginger crunch. Shopping list: 800g rhubarb, caster sugar, 1 orange, 1 397g tin condensed milk, 500ml double cream, 1 jar stem ginger, 1 good chunk root ginger, 1 packet ginger biscuits (at least 175g) 200g good quality white chocolate and 1 pot ground ginger.